Royal is Multi-Purpose WordPress Template with templates for eCommerce, Corporate, One Page site or Comming Soon Page. There is over 60 Themes to choose from this one template. It is one of the most variable Themes You can use for almost any site with any style. 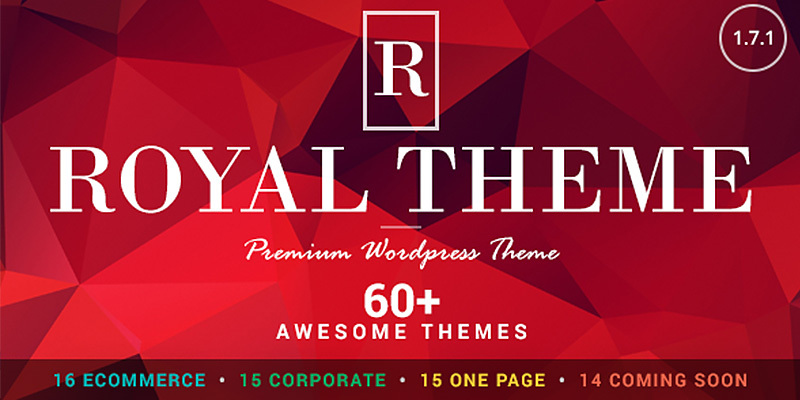 Royal Theme – is a professional, easy to use WordPress template . Clean and creative design gives a general idea about a site and also preserves an elegant touch for the details which will make your website stand from the crowd. This template can be used for any type of websites like business, corporate, portfolio, build mobile website, blog, personal, photo or image gallery, video gallery, etc. Theme is fully responsive. All page layouts work perfectly on all devices, from large monitors to smartphone’s. On the other hand, you will get the excellent theme for your store. There is no need to explain how easy and fast is to set up your new E-commerce website with this Royal ThemeEngine. Through our Installer feature (sample data) you can make your website exactly as our demo within 10 minutes.